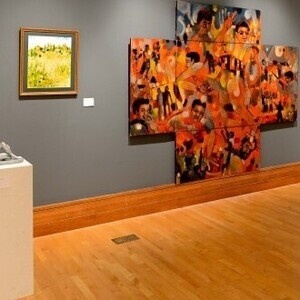 The James E. Lewis Museum of Art (J.E.L.M.A) is the cultural extension of Morgan State University's Fine Arts academic program. Developed to enhance the scholastic experience of the University's student population and the community's exposure to works of art, the J.E.L.M.A provides opportunities to experience exhibitions, programs and lectures. In keeping with the University's overall mission to offer a broad array of academic programs, the Museum is obliged to cultivate exposure to and for the urban ethnically diverse population in which it is located. In addition to hosting a varied sampling of touring exhibitions, the J.E.L.M.A will fulfill these obligations by developing art outreach programs to grade school students and by providing a forum of local, undiscovered talent. Moreover, the Museum will expand the breadth of its presentations and its activities as a collection and lending agency, to service galleries on a worldwide scale. To facilitate the anticipated growth in its artistic and cultural offerings, the Museum will enhance and expand its gallery administration program. The James E. Lewis Museum of Art has and will continue to establish relationships with local and worldwide artistic communities in an effort to provide and accessible outlet to the Fine Arts for the immediate campus population and the greater Baltimore area. Parking At the Murphy Fine Arts Center, parking is FREE in the “Y” lot. To Access the “Y” lot from Argonne Drive. Turn onto McCallum Drive. Travel straight through 1st STOP sign, to reach the rear of the Murphy Fine Arts Center. Bear to right at 2nd STOP sign. See parking lot entrance on left. OVERFLOW PARKING can be accessed in the University parking garage in the center of campus, adjacent to the stadium.